So, it has been established Draculas Castle will not be getting a re-do this year. But there are still changes on the outside. Has anyone been on it, and are there changes on the inside. Maybe it will get re-done for its 50th universe. Or, small theory here, they wont make it bigger and better, they will change it, but make it look old instead of new, keep a classic a classic with changes. Like Wartenchaney, they really like the original. Maybe they will just kind of keep the same design, but fix it up at the same time? (03-31-2019, 02:05 PM)Lagoon Lover Wrote: So, it has been established Draculas Castle will not be getting a re-do this year. But there are still changes on the outside. Has anyone been on it, and are there changes on the inside. Maybe it will get re-done for its 50th universe. Or, small theory here, they wont make it bigger and better, they will change it, but make it look old instead of new, keep a classic a classic with changes. Like Wartenchaney, they really like the original. Maybe they will just kind of keep the same design, but fix it up at the same time? I didn't see any changes on the inside, but it did appear that all the animatronics working. From I remember last year a lot of them weren't. Who knows when DC will get it's redo but it will happen at some point. My thoughts are with Primordial opening later than everyone thought the odds of it happening next year just went up. Also I would put money on Wartnerchaney giving it the same overhaul as terroride. The outdoor changes were impressive. However, they did splash concrete onto the front of the castle and railing. The queue no longer has a switchback. There is a large planter encapsulating the 2 trees in front of the owl. New sign. The ramp going to the entrance walkway is gone/a new planter. The stairs also have been totally remade. I also believe they removed a large tree so it opens up the perspective of the castle a little. I took pics. I believe Will posted them. (04-01-2019, 11:45 AM)gregwibert Wrote: I also believe they removed a large tree so it opens up the perspective of the castle a little. Removing and trimming trees, removing the bounceback booth, and enlarging the plaza at the bottom of the stairs all to show off the forced-perspective view of all four castle turrets that BT originally intended? Somebody had a good idea there IMO. 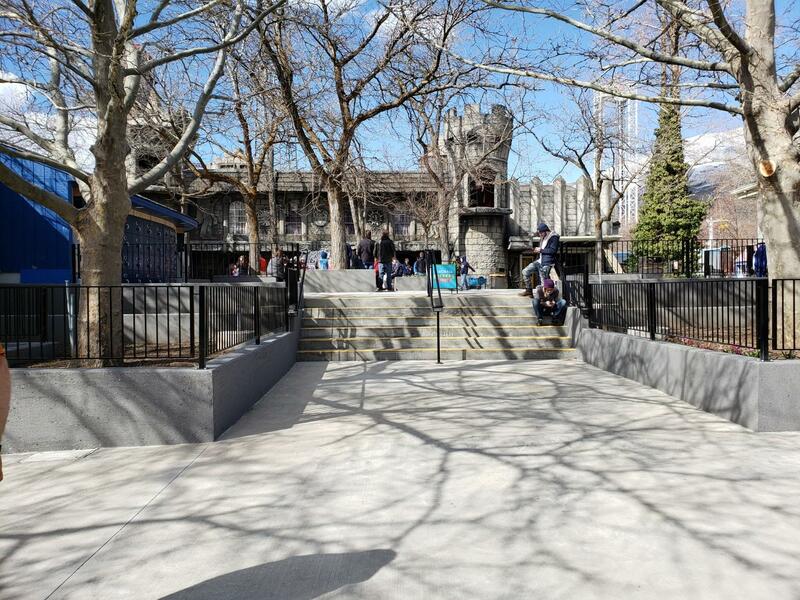 (04-02-2019, 01:11 PM)jetstar2 Wrote: Removing and trimming trees, removing the bounceback booth, and enlarging the plaza at the bottom of the stairs all to show off the forced-perspective view of all four castle turrets that BT originally intended? Somebody had a good idea there IMO. No one said the BounceBack Carts are being moved/relocated, but if they are placed again where they were, they will fit in much better and the overall flow will be improved, albeit not drastically, in my opinion. It's subtle, but it has to do with those two extra turrets. If you look closely, you can see all four turrets in this pic, but you cannot see the roof of the patio gardens. If you didn't know about the shape of the patio gardens roof, this view would give the impression that the castle is a large square fortress type castle with turrets in all four corners.You can only see this view from the bottom of the stairs. This view has been blocked by trees/bounceback booths for decades. It's still somewhat blocked by trees, and it still might not be very visible after the leaves grow in, but it appears a lot of trimming/tree removal has been done specifically to try to open up the view again. Oh that makes sense. I see what you mean.